The end of the NFL season brings the beginning of the dynasty season, and our first set of 2019 dynasty rookie rankings. 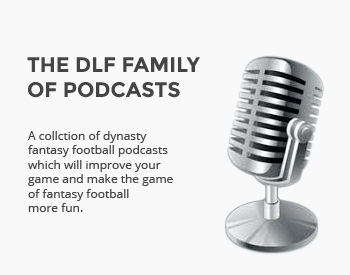 This might be the most exciting time of the year to be a football fan and dynasty fantasy football player. As we approach the culmination of the NFL season, we are simultaneously turning our collective attention to the incoming rookie class. The 2019 rookie class was finalized less than a week ago with the completion of the underclassmen declaration period. Our early 2019 Rookie Rankings are the first step in the march towards the 2019 NFL Draft. 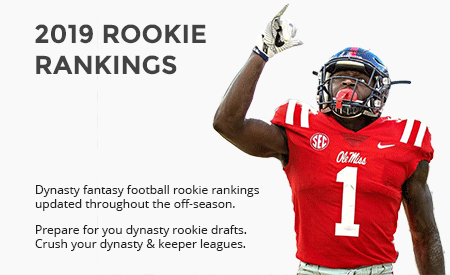 These early 2019 rookie rankings, and of course all of our dynasty fantasy football rankings will be continuously updated throughout the year and into the NFL season. 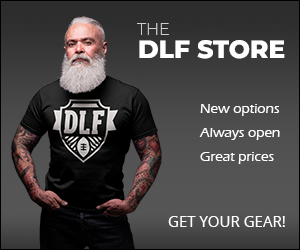 Here at Dynasty League Football, we pride ourselves on keeping you informed. 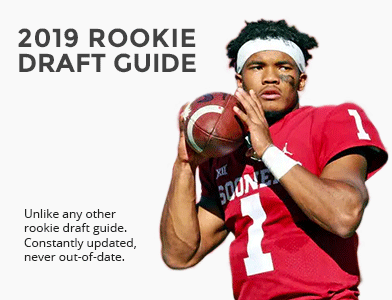 Although the Senior Bowl, NFL Combine and of course the NFL Draft are all yet to come this off-season, we have released our preliminary set of early 2019 Rookie Rankings. When it comes to a sure thing at the top of the draft, the 2019 rookie class does not offer the certainty we enjoyed in recent years. Expect a heavy dose of turnover in rookie rankings and ADP in the coming months. The post-season all-star games, next month’s Combine and the plethora of pre-draft workouts will all play a large role in ultimately determining how to value these players compared to each other. There is little difference between the players at the top of our rankings. First, former North Carolina State wideout Kelvin Harmon has drawn comparisons to Saints star Michael Thomas. While he won’t wow anyone with his speed, he does possess strength and physicality that will be attractive to NFL teams. He’s often been mocked as a first-round NFL Draft pick. Isn’t Trayveon Williams a running back? It’s a solid draft. Lacks a clear cut 1.01 or even 1.02, but the first 2 rounds have a lot of talent. Can’t wait for the combine and draft. In a 1.5 TE league…would you move Noah Fant up in the rankings? No. Why would a premium placed on a position boost a player’s value that plays that position? If anything, i would move him down a spot or 2. I might move him up a spot or two but I don’t think 1.5 PPR actually makes that much of an impact. It would be nice if one could click on the player name and college stats were included. Am I missing it? it’s interesting that if you click on Harry, both Ryan and FFGhost has him ranked 1, but he is 3rd on this list? can you explain? This was an average of all of our rankings at the time of publication. I know my rankings will continue to change throughout the offseason as these guys are so close, at least until we get Combine data, etc. Ryan do you see the first tier break at 7?